What a country! These almost make me want to make me send letters again. These stamps were some ten years in the works, they’ll be ready to lick this summer. 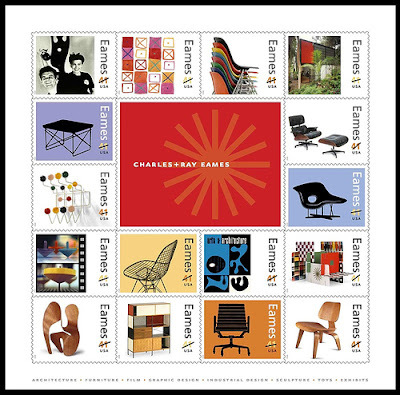 In recognition of their groundbreaking contributions to architecture, furniture design, manufacturing and photographic arts, designers Charles and Ray Eames will be honored next summer with a pane of 16 stamps designed by Derry Noyes of Washington, DC. If you’ve ever sat in a stackable molded chair, you’ve experienced their creativity. Perhaps best known for their furniture, the Eameses were husband and wife as well as design partners. Their extraordinary body of creative work — which reflected the nation’s youthful and inventive outlook after World War II — also included architecture, films and exhibits. Without abandoning tradition, Charles and Ray Eames used new materials and technology to create high-quality products that addressed everyday problems and made modern design available to the American public. Jason Fried from 37signals will speak at this Friday’s SEED Conference in Chicago, at which I’ll pit Rem against Mies. See you there! This Friday’s SEED is already sold out but Jim Coudal and the gang want to put on another. Let ’em know you’re interested here.